So it happened. The race that is. All 26.2 miles through Washington, DC on 3/16. I learned a lot about my running style and made sure to note some things that didn’t go so well during the run but enough about that for the moment….it’s time to brag a little. I qualified for Boston in 3:34! So I qualified in my old age group and my new one! My goal that day wasn’t to qualify for Boston. My plan was to run DC as a practice to find where I was weak and then spend the next few weeks working on improving. Then make the NJ marathon my qualifier. But as I neared the halfway point at 13 miles, I realized I was way under qualifying pace. So I went for it. The course: the course was hillier than I expected. Pretty sure the elevation map online was incorrect. I was anticipating agradual hill around mile 7 and was mentally prepared for it. But that was actually a really steep hill and then there were like 14 more throughout the race. In fact, the end ofthe race ended uphill. Lesson here – run more hills and stop whining. Hydration and fueling: I did a really bad job at this in DC. I brought withme 2 clif shot blocks and never took themout of my pocket. Instead, I took GU gels and ate 1/2 a packet twice. I trained prior with the gels for other races, but only with the shot blocks for this one. So basically, I ran around carrying extra weight in my back pocket for no reason (and yes, by extra weight I mean like a half an ounce). As for water, I was a mess in this area too. I didn’t hydrate properly the first 13 miles which left me in a bind the second half of the race. I actually had to stop and walk the water stops after mile 18. I would grab 2-3 cups at a time and chug them. I need to really learn how to drink while running. A talent I’m so jealous others can do. Weather: turned out way better than expected. Just light rain and clouds, perfect 43 degree temps at the start. Couldn’t have asked for better conditions. Pacing: I was all over the place with my pace after mile 12. I attribute this to my lack of distance runs towards the end of training. I really wasn’t ready to run this marathon. I had only two 20 plus mile runs and had skipped the initial buildup in miles. A no-no for all you first time marathoners. Do as I say, not as I do. Physically, I don’t think I was in the best condition to be running my best but it was good enough. I kept calculating time and how much time I could slow down for so I could still BQ. And I took full advantage of those minutes in the last few miles as I shuffled through to thefinish. Tapering: I actually did this really well for once. I kept telling myself to trust the taper. I did. And thus, on race morning I felt relaxed, my legs felt energized, and no injuries on race day. A few days prior to race day, my tendonitis flared up, but I took the time and rested and iced and was ready to go after that. Mental mind game: Here’s where I did everything terribly wrong. While I’m so happy I had a BQ and PR; I am not happy with my race physically and mentally. I kept trying to quite the entire race. I told myself to make it to the half marathon finish and get a medal at least. I could count that as a training run then. Then I told myself to make it to the next mile, and then if I made it to the next water stop I could stop, etc. It was a mental nightmare. I didn’t feel strong. I felt defeated at mile 12. There came a point where I had to decide if I was going to miss the chance for a BQ when I was halfway there already. I pushed through. I wish I could say I found my strong and overcame hitting the wall. But I was weak the entire end of the race. The last 6 miles felt like torture. Overall, this was a great course and I’m so happy to have run it (except you Mr. Steepie Steep Hill). The race organizers did a great job and I want to give big thanks to the volunteers and supporters who came out that day. Without you guys, I wouldn’t have made it through. 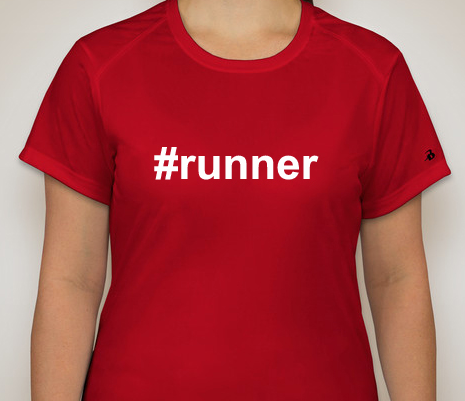 I wear a lot of titles with pride: Mommy, Wife, Friend, Sister, Daughter, Coworker, etc….but there is one title I have shied away from…Runner. I average about 25 miles a week, so you would think it is a slam dunk to consider myself a runner. Why then do I struggle with this? I read running magazines, blogs (obviously) and chit-chat with other runners. I hear talk of training programs, diets to “fuel your body,” strategies to “attack your next workout” and the importance of listening to your own body…..Let me be clear – I do NONE of this. That’s right – not any of it. The only diet strategy I know is “try not to eat so much chocolate you make yourself sick.” In all seriousness, I try to eat healthy, but I suffer from a serious sweet tooth. My training program is simple…I go out and run. I set silly goals for myself when I am doing it. For instance, as I approach a race, I may not let any run be shorter than 4 miles. (I know, I am setting the bar really high with that one! Hahahaha!) I try to get in one long run a week…And that’s it – that is the sum total of my training plan! Oh wait! One more thing…there is a girl who works in my office building who also runs at lunch. About once a week I “treadmill race” her….she doesn’t know that we are racing, but I do…sadly, she always wins. hahaha! I don’t mind because it still pushes me to try to catch her next time. So here is what I do know about me…I ran today because I knew it would calm me down. In fact, that is why I run most days. I like the feeling of accomplishment when I finish a long run. I think it is cool when I realize I have gotten faster or my endurance has improved. I work fulltime, I am a mom of two little kids and 2 dogs, I am a wife and I can get over-whelmed by life sometimes. Running keeps me balanced and it gives me that much-needed time to shut everything off and just exhaust my body and let my mind rest. Last weekend I ran 10 miles in 1:25. That is faster than I thought I could ever run 10 miles in my life. (Who knows, maybe next year I will be even faster!?) I will probably never qualify for the Boston Marathon. Heck, I may never even run a marathon at all. I may not take training seriously. I may not be a runner for life. I may hate running on a freezing cold and windy day. I may not be a runner like you, or you, or you. I know all these things. Oh, and I know one more. Today, I went for a run and after I was done I felt better about myself and the world than I did when I started out….and for that reason alone, I will probably try to run again tomorrow. Am I a runner? I don’t know, but whatever I am, I am ok with it.